Climate change. Energy security. Water shortages. These perils affect our world and increasingly the ability of businesses to operate profitably. In the face of soaring energy prices and decreasing inventories of natural resources, larger businesses are taking steps to control their costs. In addition, these businesses are implementing environmentally friendly practices in order to manage risks, appeal to a growing base of consumers who make planet-friendly purchasing decisions, meet green procurement standards of business customers, enhance their image and attract value-driven talent. Combined these components create a competitive advantage. The benefits of environmentally friendly practices are also available to smaller organizations. 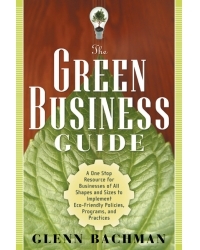 The Green Business Guide also contains dozens of user-friendly checklists for every facet of making a business more environmentally friendly. By following the guidance contained in this book, organizations will position themselves as leaders in the marketplace, in their industry, and in the communities in which they operate. Business is recognizing the importance of being a responsible corporate citizenónot only to avoid negative publicity and brand erosion, but also to enjoy benefits that translate directly to the bottom line. Glenn Bachman, CMC, AICP, is president of Raven Business Group, LLC, a management consulting firm located in Massachusetts. Combining his expertise in strategic thinking, environmental management, and systems analysis, Bachmanís practice has evolved into sustainability consulting: assisting organizations that desire to become more ecologically and socially responsible, while maintaining their profitability. He has more than 30 years of experience in improving the economic and environmental performance of organizations and projects through consulting and training engagements. Bachmanís portfolio includes Environmental Impact Statements, energy facility cost-benefit analyses, strategic plans, business plans, and environmental audits and reports prepared for business, non-profit organizations, educational and governmental clients. He has a BA from Bowdoin and a masters in planning from the University of Oregon. Bachman is also vice president of the board of the Apeiron Institute for Sustainable Living, a non-profit organization working to promote sustainable practices in Rhode Island area households, businesses, schools, and government.